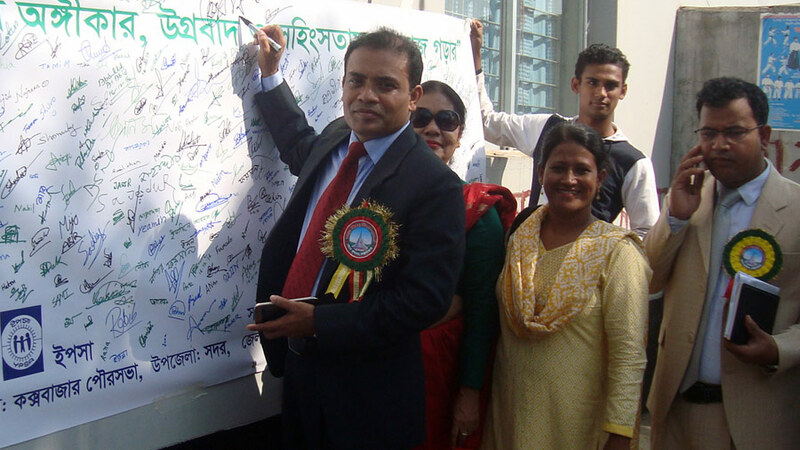 A signature campaign on “Pledge on victory day: Make society free from violent extremism” was arranged with the participation of the members of youth groups in 75 places at different Unions and Pouroshova of Cox’sbazar district. Additional DC (general) Kazi Abdur Rahman; Additional DC (Education & ICT) Saiful Islam Mazumder; Additional District Magistrate Khaled Mahmud and UNO of Cox’sbazar Md. Shahinur Islam have expressed their solidarity with the campaign giving their signatures. YPSA consortium (YPSA, SHED, HELP, and JNUS) undertakes a project “Community Engagement in Countering Violent Extremism in Cox’s Bazar” aiming to sensitize and organize youth as they would be able to work as an actor to raise awareness, identify the signs of radicalization and serve as a force multiplier effect in communities where violent extremism and recruitment may occur. To facilitate youths to engage them in social action and provide livelihood skills development training to the selected youth from youth groups at ward level, engage them in income generation activities. Awareness building activities and other intervention will be done as the local government and other civil society organizations, CBOs, media, faith-based organizations and governments would provide active support by developing comprehensive and effective mechanisms to prevent violent extremism and radicalization.